Chris Brogan needs no introduction to some TrustMatters readers. Some of you caught him at the Trust Summit last fall; Others may never have heard of him. I’m about to do the second group a huge favor. Chris is co-author (with Julien Smith) of Trust Agents, CEO of New Marketing Labs and an active speaker and blogger. But that’s nothing. Chris is a guru in the new social media space; a Twitter deity; and an all-round major influence in the emerging new world of commerce and social interaction. I find Chris doubly interesting; not only does he have solid things to say about trust, he lives them in a most authentic and high-integrity way. He is a genuinely, really, really nice guy—and I think he’s as famous for that as for anything. We caught up with him right around his 40th birthday; rather young for the life he’s lived already. CHG: Chris, how do you define your work these days: is it new social media? Marketing? Trust? Public speaking? Who is Chris Brogan anyway? CB: My work is divided into a few camps right now. My company, New Marketing Labs, LLC, works as marketing consultants providing strategy and execution for online and social media marketing for Fortune 100/500 types. My media business, currently thought of as ChrisBrogan.com, is where I do public speaking, blogging, book authoring, and the like. CHG: You finished writing Trust Agents nearly a year ago. It hit NYTimes best seller territory, and is still ranked #3,000 today. That’s very successful. For the uninitiated, what is Trust Agents about? CB: Julien and I wrote Trust Agents about how to be human on the web. We wrote about this new type of business application for social tools, which, when used by talented individuals (either in a company, or a church, or a nonprofit, or as a solo entrepreneur) can help people gain awareness, build reputation, and earn trust. We talk from the high concept all the way down to actionable steps about what elements people seek to attain trust via the extended digital world. CHG: Have you developed some perspective on it yet? Do you see some aspects of it as more important now than when you wrote it? Less? CB: Great question. I think both Julien and I believe that the most important part of Trust Agents is in building and maintaining your network. We’ve learned since the book came out that the most applicable parts for people to follow were about the way they interacted with others, and how they transferred value back and forth along their network (and we could define “value” as anything that improves the experience of a person in the network – such as helping a friend find a job). CHG: My impression is you’re synonymous with Inbound Marketing. Is that right? More importantly, my strong impression is that in any case you conduct your life according to those principles. Can you share a little about both the definition of inbound marketing, and how you practice it? I’m thinking of things like 12-other referential tweets for each one of your own, or the way you once responded to a taunt/challenge from Robert Scoble. CB: The folks at Hubspot coined the term “inbound marketing,” partly because Seth Godin has a copyright on “permission marketing.” In all cases, we all believe that beating people over the head with your needs and desires to sell products or services isn’t a successful strategy any longer. We look to build relationship-based selling models, such that we turn audience into community, and we guard our relationship with our community as an asset, every bit as much as we guard our trade secrets. CHG: We hear an awful lot of talk these days about the decline of trust in institutions today. I’m sure you understand that, but do you also notice that and experience it yourself? 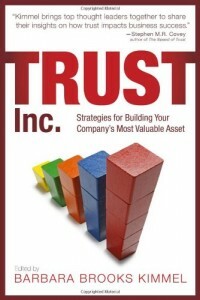 In fact, do you find significant areas where trust is in fact increasing? CB: The big revolution that’s brewing is that we, the people, are sick of being numbers. We want to be seen and heard, and treated as individuals. The oft-cited example in the US for trust improvements are places like Comcast, who found their customer service approval scores a bit higher since the efforts of Frank Eliason and his @comcastcares Twitter efforts. There are lots of anecdotal examples along these lines. Dell Computers has been in the camp of more trustworthy and more human, ever since 2005, when Lionel Menchaca came on the scene to humanize them. Significant areas, though? Not yet. I’m hoping this is the year we start demanding more trustworthy relationships. CHG: Are you optimistic about prospects for trust in the emerging economy of our time? Can you explain a bit about why? CB: Interesting question. I think one way we’ll see more trust bubble up is through the creation of all these Internet businesses and Internet-born brands. No one had heard of Gary Vaynerchuk a few years ago, and now, if Gary says this is a wine you need to try, thousands and thousands of people will buy that bottle. Trust developed to make up for a younger brand relationship might be the big lever that gets older organizations to have to rush in and follow suit. It’s how I see it potentially shifting. Look at car companies. In this new landscape, they KNOW that trust is one of the only ways to settle up and move forward. CHG: Is trust in the new social media world the same as, or different from, trust in the old analogue world? How can they cross over? CB: There are some weird differences in trust in the social media world, but in a way they parallel the way (western) society seems to be evolving. We have no long-term memory any more in this country. Sins of the past wash away a lot faster, it seems, in many situations. We also seem to demand a more gritty, three-dimensional reality from our brands. Further, we want an entertainment factor to our education and information delivery. All these traits in the analog world translate quite nicely into how social media delivers interactions around relationship-building, media making, and community environments. This new web is a lot more social, a lot more touchy-feely, and a lot more insistent on a more human interaction. For me? Good times, and I hope that’s how others see this opportunity. We buy from people we know, and these tools allow us to build strong relationships before the sale. CHG: Chris, many thanks for taking time out of what has to be one of the busiest lives on the planet; it’s always a pleasure, and I really appreciate it. This is number 9 in the Trust Quotes series. Reliability should be one of the easiest components of trustworthiness; but we all have room to improve.